During my afternoon visit to Carrigafoyle Castle and Carrig Island last weekend, I went in search of the old Church of Ireland parish churches in Aghavallin and Ballylongford. The churches have been closed for many decades, but they are still fondly remembered in this group of parishes. Although the parish of Aghavallin or Ballylongford has long been part of the grouping that includes Kilnaughtoin or Tarbert, this parish and its parishioners still maintain their distinct identity, and I thought it would be worth looking for the church and its mediaeval story. The name Aghavallin may mean the ‘field of the little bed,’ and the parish and its ancient church were long associated with the O’Connor Kerry family, who built nearby Carrigafoyle Castle. The first clergy in the parish are recorded as late as the 15th century, when the parish was served by a succession of members of the O’Kennelly family, although some of them were appointed vicar despite not being ordained. In spite of popular images of celibacy and clerical discipline in the late mediaeval church, many of these vicars were married, were father-and-son, and were not ordained until after they had secured office. Some of them seem to have been poorly educated, and many had their legitimacy challenged in diocesan courts and as far as the papal court in the Lateran in Rome. The next recorded vicar, Maurice Y’Kynnelyd, seems to have been in the parish from about 1418, but was not ordained priest until 1427. He was then deprived of the parish in favour of his son, Thady O’Kynelyd (O’Kennelly), who was appointed on condition that he was tonsured. However, there is some confusion in the records about what followed afterwards. In one account, Thady is said have been forced to leave the parish because he was not ordained. In another account, Thady is said to have remained in the parish until he died in 1449. In the meantime, two other vicars are named in the parish: Donatus O’Chinnela or O’Kennelly, who held the parish for over a year until 1432, when he was deprived because he had not been ordained priest, and Cornelius O’Chuachall or O’Tuohill was appointed when Donatus was removed. When Thady O’Kinaladh or O’Kennelly was removed in 1449 because he had not been ordained priest, he was replaced by John O’Colmayn or O’Colman, whose appointment was disputed because he was illegitimate. Cornelius O’Chomychur or O’Connor claimed the parish as Cornelius O’Tuohyll’s successor because John O’Colmayn or O’Colman had held it for a year without being ordained priest. The challenge was brought to court in Limerick, and eventually decided in favour of Cornelius O’Connor in 1452. For the rest of the 15th century, there was a series of disputes about the appointment of rectors and vicars, with accusations of simony, perjury and illegitimacy and claims that those appointed were either not properly ordained or already held appointments in the Diocese of Lismore or were refusing to live in the parish. In the post-Reformation and post-Restoration eras in the 16th and 17th centuries, many of the Vicars of Aghavallin were pluralists. Sir John Morgan, who was Precentor of Ardfert, was Vicar of Aghavallin, Listowel, Disert, Liselton and other parishes by 1675, but because of his infirmities he was given leave of absence from the parishes in 1679 and again for six months in 1681. During his lengthy absences, the Revd William Robinson served the parish as curate. But eventually, in 1696, Morgan was deprived for non-residence. The Revd Anthony Stoughton was appointed Vicar of Aghavallin on 11 June 1781, a day after he was ordained priest, and when he was still only a 20 or 21-year-old. The Stoughton family claimed the right of presentation or to nominate the vicars of the parish and to collect the tithes. When Anthony Stoughton died in 1833, Thomas Stoughton presented the Revd Edward Maynard Denny, a grandson of Anthony Stoughton, to the parish. During his time as vicar, the church was rebuilt around 1840, and Horatio Herbert Kitchener, the future Earl Kitchener of Khartoum, was brought to the church to be baptised in September 1851. A new church was built nearby in Ballylongford in 1858. After the Disestablishment of the Church of Ireland, the Vicars of Kilnaughtin (Tarbert) were also Vicars of Aghavallin from 1872 to 1878, when the parish was united with the parish of Listowel. The new church closed in Ballylongford, the mid-20th century, was sold, and has since been demolished, the site used for building a family home. But the ruins of the older church still stand on the old mediaeval site at Aghavallin, surrounded by old graves and tombs. The graves in the church and churchyard include the Collis, Colt, Crosbie, Fitzell, Lindsay, Ponsonby, Pope and Sandes families, but I could find no graves for the Kitchener family. The church itself is fenced off, with a warning that the building is unsafe to enter. The old baptismal font now stands beside the porch at the entrance to Saint Brendan’s Church in Kilnaughtin, Tarbert. Today is the Feast of the Birth of the Blessed Virgin Mary. This is one of her few festivals that is provided for in the Book of Common Prayer of the Church of Ireland, which also include the Feast of the Annunciation (25 March) and the Feast of the Visitation (31 May), but not the Dormition or the Assumption, the commemoration of her death (15 August). The provisions of a full set of readings, a collect and post-communion prayer, as well as Penitential Kyries, Peace, Preface and Blessing, presumes that this festival will be celebrated with the Eucharist today [8 September] in cathedrals and parish churches throughout the Church of Ireland. I was first invited to preach in Saint Mary’s Cathedral, Limerick, when the Very Revd Maurice Sirr was the Dean of Limerick. Canonical scripture does not record the Virgin Mary’s birth. The earliest known account of her birth is found in the Protoevangelium of James (5:2), an apocryphal text from the late second century, in which her parents are named as Saint Anne and Saint Joachim. Tradition says Joachim and Anna were childless and were fast approaching the years that would place Anna beyond the age of child-bearing. Traditionally, the Church commemorates saints on the date of their death. The Virgin Mary and Saint John the Baptist are among the few whose birth dates are commemorated. The reason for this is found in the singular mission each had in salvation history, but traditionally also because they were also seen as being holy in their birth – Saint John was believed to be sanctified in the womb of his mother, Saint Elizabeth, before his birth (see Luke 1: 15). The earliest document commemorating this feast is found in a hymn written in the sixth century. The feast may have originated in Syria or Palestine in the early sixth century, probably after the decrees of the Council of Ephesus. The first liturgical commemoration is connected with the sixth century dedication of the Basilica Sanctae Mariae ubi nata est, now called the Church of Saint Anne in Jerusalem. By the seventh century, the feast was celebrated in the Byzantine tradition as the feast of the Birth of the Blessed Virgin Mary, but the Latin Church was slower in adopting this festival. In the eighth century, Pope Sergios (687-701) adapted the festival from the Orthodox calendar. The idea of the Immaculate Conception was not promulgated by the Papacy until 1854. The Orthodox Church disagrees totally with the concept of the Immaculate Conception. The Orthodox position is that since Jesus Christ is God, he alone is born without sin. Orthodox theologians argue that if the immaculate conception is taken literally, the Virgin Mary would assume the stature of goddess alongside God. The popularity of the name of Mary attests to the glorification of the Virgin Mary. The Orthodox believe that she was conceived in the normal way of humanity, and so was in the same need of salvation as all humanity. Orthodox thinking varies on whether she actually ever sinned, though there is general agreement that she was cleansed from sin at the Annunciation. The icon and the feast acknowledge a transition from barrenness to life. This foreshadows what is offered through Christ – the transformation from death to eternal life. In the traditional icon, Saint Anna and Saint Joachim are depicted embracing to indicate the joy of all humanity at this blessed event. 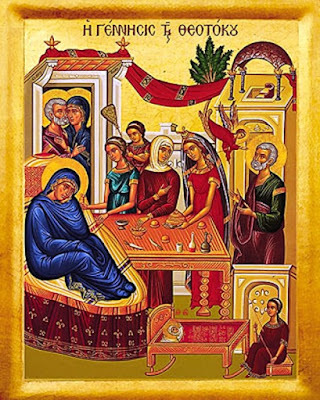 The icon and this feast prefigure the Feast of the Nativity of Christ. But there is a stark contrast between her Nativity and his Nativity: he will be born in a cold and hostile setting, while she is born in a safe and comfortable place. In these traditional icons, Saint Joachim is show hearing from an angel that he and his wife would be blessed with a child, while Saint Anna reclines on a bed, recovering from the childbirth. These icons illustrate the tradition that Saint Anna invited pure young women to attend and assist with the care of her child. Some icons also show a banquet on her first birthday, to which scribes, priests and elders were invited. Readings: Isaiah 61: 10-11; Psalm 45: 10-17; Galatians 4: 4-7; Luke 1: 46-55.